The multilingual news agency, APAnews Monday held a fitting sendoff Monday for its former news editor Demba A. Jawo who was appointed Information minister in The Gambia last month. Until his appointment by the new Gambian government in February, Mr. Jawo worked as news consultant for the African Press Agency following his retirement from the agency four years ago. The affable Gambian who led the agency's English department from 2006 until his retirement in 2013 was accompanied to the APAnews offices in Mermoz, Dakar by his wife. Employees of the agency took turns extolling his sterling qualities as a professional colleague and a charming man of impeccable character and demeanour and wished him luck in his new endeavour as minister in a new Gambia entertaining immense hope for the future. 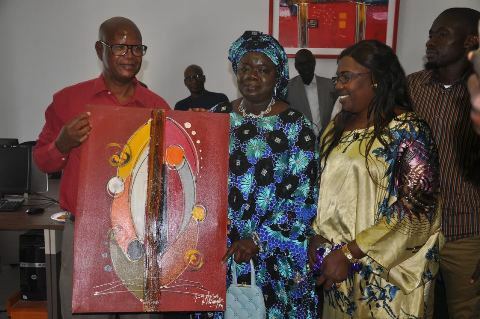 After being treated to a sumptuous luncheon, he was later presented an art work by a senior staff of the agency as a token of appreciation for his invaluable contribution to the success of the agency and his admirable interpersonal relations among his former colleagues. As Gambia's minister of Information, Mr Jawo promised to retain his personal relationships with former colleagues and kick-start professional collaboration between the agency and his ministry as soon as he assumes office in earnest. With a university education from India, Mr. Jawo has spent more than four decades in journalism and led The Gambia Press Union as president for four years, playing a leading role in fighting the cause of press freedom in his country. While living and working in Dakar but visiting his native Gambia regularly, he was a critical voice against human rights violations and other injustices, corruption and maladministration under the leadership of then President Yahya Jammeh.